To celebrate Star Wars Day (yes, we capitalise this important life event), LEGO has come up with a handsome addition to its Ultimate Collector Series – a 1,967-piece Y-Wing worthy of a place next to your £649.99 Millennium Falcon. Set 75181 retails for £169.99, and continues LEGO’s recent run of more movie-accurate, adult-focused models. Of course, this isn’t LEGO’s first Y-Wing, or even the first Ultimate Collector Series version of the starship – that particular honour goes to 2004’s 1,473-piece set 10134, designed by Jens Kronvold Frederiksen, the deranged genius behind the gigantic aforementioned UCS Millennium Falcon. 2007 and 2012 also saw small Y-Wings (76581, 446 parts; 9495, 458 parts respectively), and most recently we’ve had the 691-piece set 75172, released in 2017 to tie in with Rogue One. What this 2017 set lacks in scale and complexity, it makes up with an abundance of fun minifigs – besides a pilot, astromech droid and stormtrooper, it includes blink-and-you-miss-them movie characters rebel Admiral Raddus and Saw Gerrera-affiliated mercenary Moroff. At 41cm long and 20cm wide, and with firing lasers and bombs, its emphasis is on play value over accuracy and scale. The 2018 Ultimate Collector Y-Wing is an altogether more serious affair, aimed squarely at grown-up fans of the Original Trilogy – its only minifigs are Gold Leader and R2-BHD – and it packs in a huge amount of detail on its 61cm x 30cm frame. In fact, as a build, you’ll be creating an awful lot of intricate engine trim out of piping and grille pieces, so you might want to start your finger dexterity exercises now. One of the nice things about this model is that it has been designed to look great on display, so the early parts of the build are dedicated to creating a rock-solid central structure – the mounting point for the base is in the middle of the ship, so this part of the chassis has to bear the weight of all the parts hanging off it, like the nacelles and cockpit. As a result, there are plenty of Technics beams and rivets which will require careful lining up – a mistake here will require surgery later on. 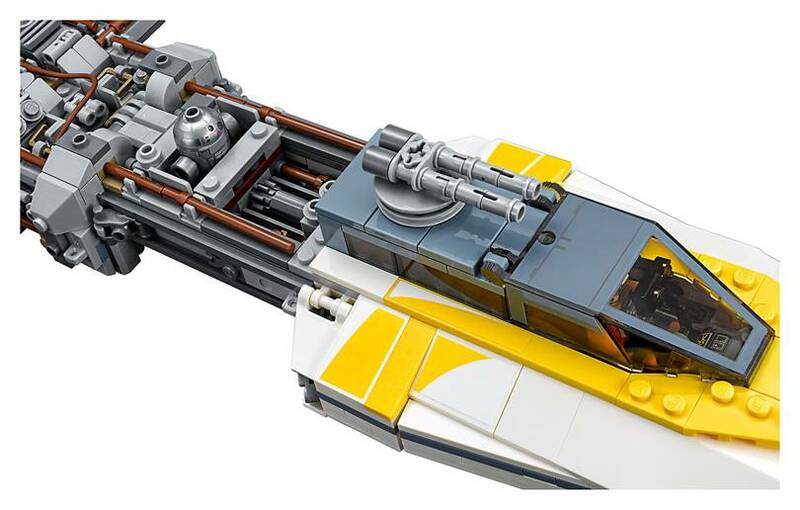 Of all the Y-Wings, this one has the best cockpit by far – rather than try to recreate the iconic white-and-yellow fuselage in coloured bricks (as in past versions), the designers have sensibly opted for angled white blocks, with yellow decals to add the all-important racing stripes. This gives a pleasingly accurate shape, and the fact it’s larger than previous ones has allowed for cute interior details, such as an adjustable targeting computer for your pilot. The nacelles are unintentionally hilarious to build, and we challenge any adult to build them without dissolving into fits of laughter halfway through (see the video. Sorry, LEGO.). But once you’ve recomposed yourself, you can appreciate the clever use of side-mounting to create an impressive in-the-round texture that really looks like a piece of spacefaring machinery. A display stand to show off your labours (it took WIRED about five hours) at a jaunty angle is a thoughtful addition, though it is a little wobbly – you’ll need a very stable surface if you don’t want to see your pride and joy waggling in a most worrying fashion.